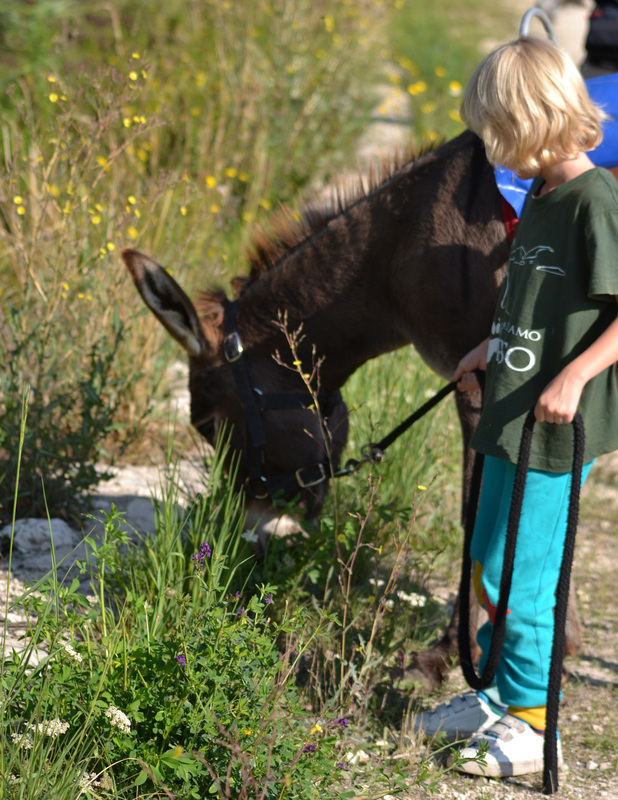 One of the best family adventures to have in Abruzzo is a morning’s donkey trekking from the small Medici town of Santo Stefano di Sessanio up to Rocca Calascio that is in National Geographic’s list of Top 10 European castles. Joining this caravan of donkeys could be the first time as a family with young children you joyfully manage a 4-hour circular hilly zig-zag walk without any mention of “when will we be there”! As a parent it’s hard not to look back longingly on those long walks you used to take together before you were a Mummy and Daddy, so the solution dreamed up by Chiara, who runs Gira e Rigira, and her donkeys for family hikes accompanied by a historical or cinematic guide is wonderful. The donkeys happily carry bags and the little ones when they get tired, the little ones feel a great sense of responsibility leading and steering the donkeys and actually finishing a long hike, whilst Mum and Dad go home knowing the region a little more as well as happier that there is a way to do hikes from the past as a family. 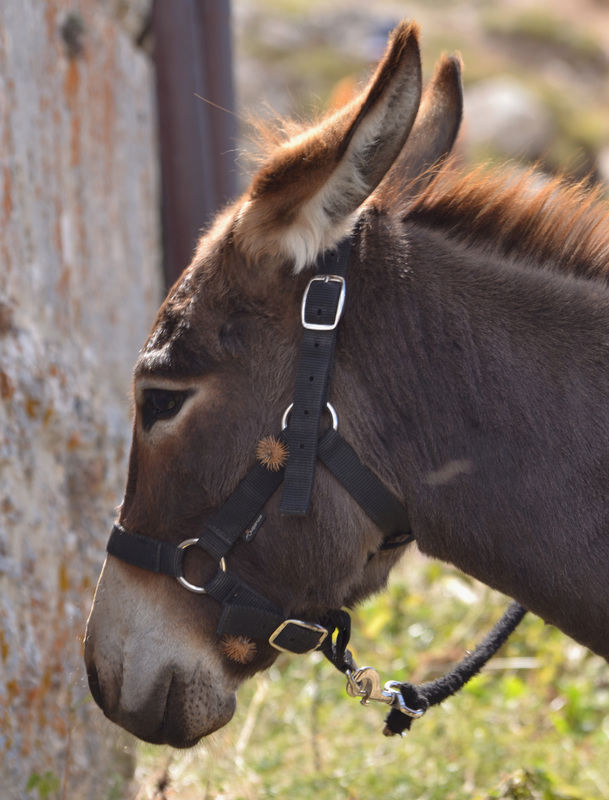 Children are invited to get to know each of the donkeys through grooming them before saddling up and setting off. 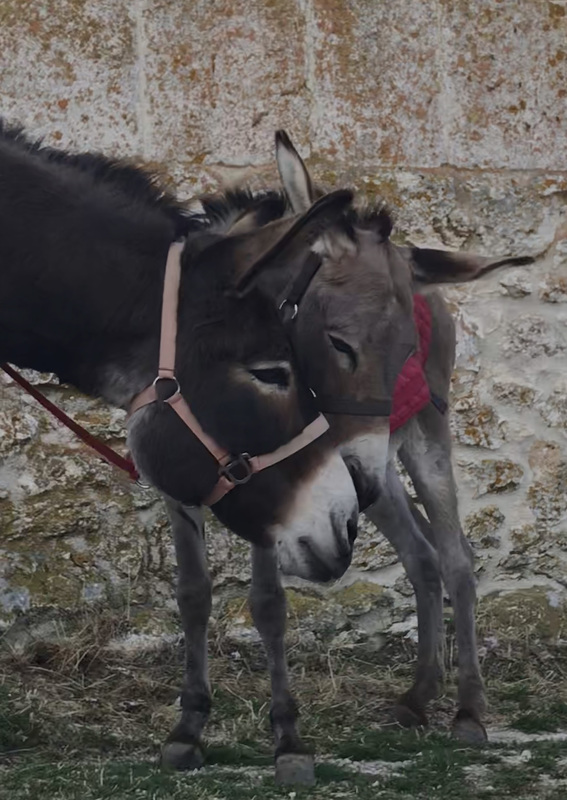 The donkeys are all sourced and trained by Asinomania, a donkey sanctuary in Introdacqua just outside Sulmona, that was backed by EU funding to assist young people with issues as well as help source donkey milk. It’s a little known fact outside Mediterranean countries that donkey milk is the best substitute to human breast milk, and was previously used by mothers who were unable to feed their babies. It doesn’t come cheap at €10 a litre which is why only people like Cleopatra bathed in it! 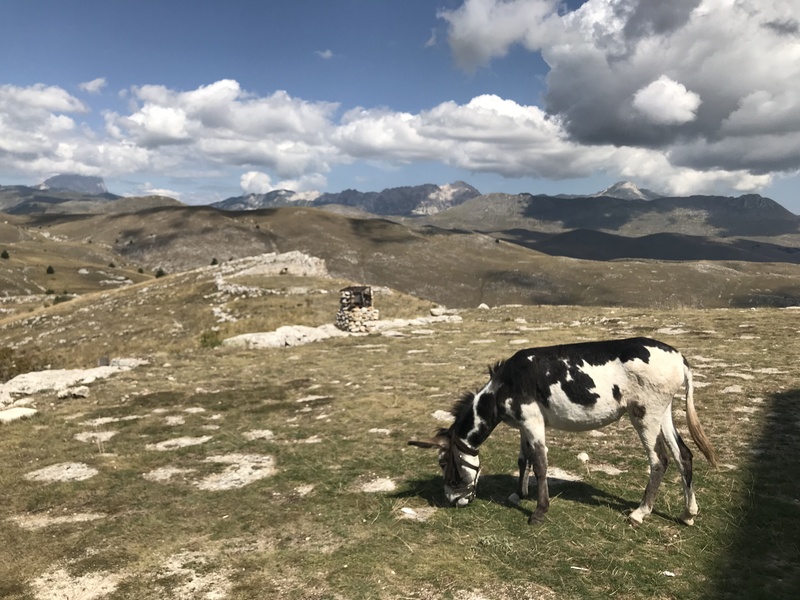 The donkeys set the pace making this an unhurried, slow walk that allows you to take in the incredible panoramic landscape of Campo Imperatore that is alive and buzzing with flora, fauna and insects. It was wonderful to explore the rich history of Abruzzo as a cinematic backdrop courtesy of the passionate Abruzzese film historian Piercesare Stagni. He is one of Italy’s leading film teachers, and for those who don’t speak Italian he speaks excellent English and can carry a story as well as any actor! Many early Italian films utilised Abruzzo’s enigmatic & sometimes bleak landscape. Avezzano after the 1915 earthquake perfectly represented war-torn Italy, whilst modern movies such as George Clooney’s The American (2010) and the now being filmed series, The Young Pope sequel with Jude Law and John Malkovich bring the region superbly to life with colour and vivacity. Spaghetti Western classic They Call me Trinity (1970), most famous for the “bean scene”, the location of which has now become a place of pilgrimage for lovers of the film, genre and the main actors Terence Hill and Bud Spencer. The Name of the Rose (1986), Annaud’s adaptation of Italian author & semiologist Umberto Eco’s famous novel, starring Sean Connery & Christian Slater, which used the fortress Rocca Calascio to great effect. Fantasy classics Krull (1983), Ladyhawke (1985, starring Matthew Broderick and Michelle Pfeiffer) and Red Sonja (1985, starring Brigitte Nielsen and Arnold Schwarzenegger). Chiara can arrange lunch either in The Refuge restaurant in Calascio or back down in the Locanda sul Lago followed by a quick presentation by Piercesare putting famous shots to the films we hadn’t previously heard of.